Provide your guests with condiments to complement your hot dogs, hamburgers, french fries, and other savory dishes. Portion control packs and jars enable your restaurant to conserve condiments and provide guests with a user-friendly receptacle. Spice up your favorite Asian-inspired recipes with our selection of Asian sauces and glazes. 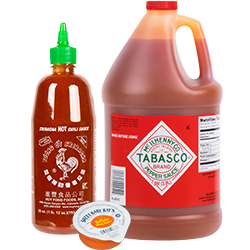 Add a bold flavor to almost any dish with our selection of wing sauce, hot sauce, and Asian hot sauce! 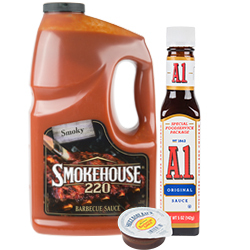 Use our selection of BBQ and steak sauces as a dipping side for nuggets, tenders, and other appetizers, or as a marinade on raw meats for grilling! 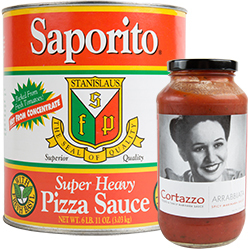 From pasta to pizza, finding a can of tomato sauce diverse enough to work with multiple dishes on your menu has never been easier. 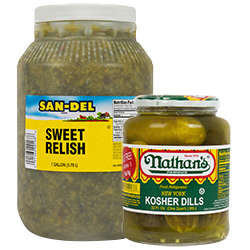 Perfect for burgers, hot dogs, and more, pickles and relish deliver the rich, savory flavors your customers love and expect. 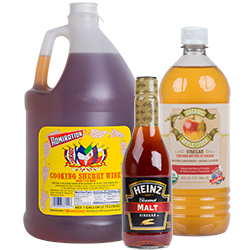 Provides a rich, flavorful addition to vegetables, proteins, and more with cooking wine and vinegar. Make sure your restaurant, bar, cafeteria, or concession stand stays stocked up on wholesale condiments and sauces. Our assortment of salsas, marinades, and various condiments is ideal for a wide range of cuisines, from Asian stir fry to barbeque chicken wings. 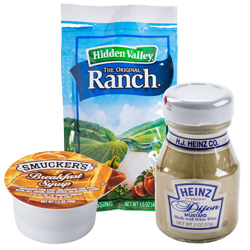 Use these condiments and sauces in the kitchen during food prep, or place them on your tabletops for guests to use. For other great supplies, bread, bag in box soda, and frozen fruits and vegetables. If you're wondering where to buy condiments and sauces, we have a large selection of condiments and sauces for sale at the lowest prices. Looking for a naturally-delicious way to sweeten your most popular foods and beverages? Honey is a popular sweetener that has a variety of colors, flavors, and uses. This guide will help you differentiate between the floral, mild, and hearty types produced by the honeybees. It will also explain the importance of sourcing true, high-quality honey for your restaurant. So many condiments , and so many condiment containers ! Knowing which holder or dispenser is right for what food product can be tricky, especially with so many types of containers available. From basic ketchup and mustard to the not-so-basic array of yogurt or fajita toppings, condiments come in a variety of forms that their containers must account for and accommodate. So regardless of your menu, understanding what your options are for storing condiments at the table, on the counter, or in the kitchen is paramount to delicious dishes guests can tailor to their personal tastes. Stock your restaurant, commercial kitchen, hotel, or concession stand with these wholesale condiments and sauces. We offer a variety of restaurant condiments, spreads, sauces, and marinades that will add the finishing touch to your breakfast, lunch, or dinner entrees. 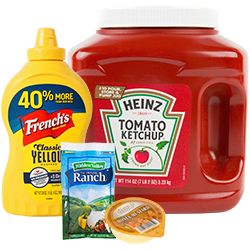 Whether you’re looking for ketchup, mustard, mayo, and relish for your pump dispensers, or you need salad dressings, jellies, and sweeteners to throw in to-go bags, we have you covered. We offer sauces and marinades as well as wholesale condiments to accommodate both back- and front-of-house needs. Browse our condiments that are packaged in bulk containers, so you can cut costs and keep a good supply at hand. Or, fill your tabletop caddies and breakfast bars with our selection of portion control packets that will reduce product waste. 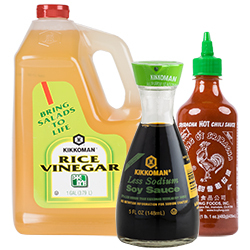 We also carry various sauces and marinades to create delicious stir fry, salads, appetizers, and more.